Good Morning! I'm up early today and I'm hoping to get a head start on my errands and house work. I made this card using a digi image from FireCracker Designs by Pamela. The image I used on my card is called 'For the Birds'. The image was printed and then I heat set it using my heat gun. You will want to be sure to heat set your images to keep them from smearing. I usually do mine for at least 30 seconds. Once it cooled off, I began coloring using my SU markers. When I was finished coloring I added a white dot in the center of the flowers using my white gel pen. My background is embossed using my Cuttlebug and D' Vine Swirls embossing folder. I chose this folder because I thought it closely resembled the swirls in the digi image. I'm also submitting my card for today's ways to use it challenge on Splitocast. Today's challenge was to find ways to use ribbon. I have shared this tip before several times, but for those of you who may not know this- I don't always have just the right color ribbon that I may need for my cards. So I sometimes end up coloring my ribbon using my SU markers, which is what I did on this card. If you try this, you'll want to make sure to color both sides of your ribbon and most importantly, you need to let it dry completely. Thank you for taking the time to stop by and I'm so very grateful for all of my followers. I truly enjoy sharing my work with you all! 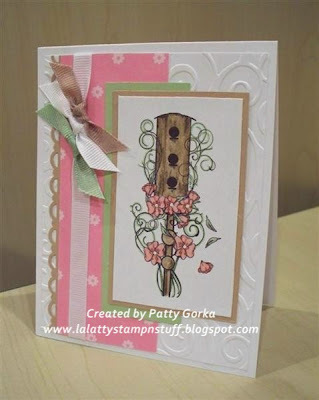 Tomorrow I will be posting my card for FireCracker Designs' blog hop. Be sure to stop on by and join in on the fun! Very pretty! I love your coloring! Lovely! I love the background swirls and the pink patterned paper. Love the 3 ribbons. I never think to dye anything. This is so pretty! So soft and feminine. Love it. Gorgeous- so you achieved that gorgeous wood look to the birdhouse with SU markers? I have to give that a go! Love the pretty colors on your card and the great L.O.! The ribbon colored to match is 'frosting'!!! SO pretty! And thanks again for the tip about the ribbon. I WILL try that one. Very sweet card! And nice job on the coloring. I love it! Love what you've done with the ribbons. Wow, this is really stunning! I love it!